Casey Kent is a teenage cancer survivor and hates being seen by her friends and family as fragile. So when she tries out for the local roller derby team, many are hesitant to allow her to do so -- especially the team captain, who seems to want to do nothing but make her life miserable. But Casey soon finds out that cancer was a walk in the park compared to the new demons she must fight: well, that's because they're actual demons. Carrie Harris's novels are perfect to give to readers like me who don't particularly like paranormal stories that involve zombies, werewolves, demons, and the like because there is always an element of comedy in her writing. Laughter and smart-assery are Carrie's M.O. in her writing and in her life -- and no doubt Carrie will read that statement as a badge of honor, as she should. 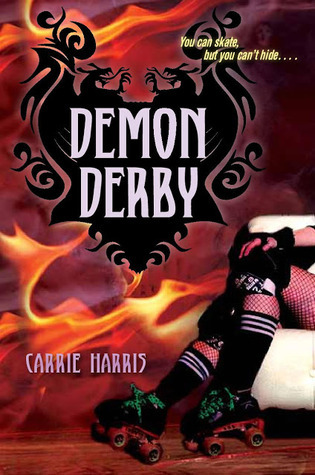 In Demon Derby, the comedy is toned down more so than it was in her first two books, Bad Taste in Boys and Bad Hair Day, but it's still there. However, what Harris adds to this narrative is a greater purpose than her previous books. You see, this book is dedicated to her husband Andy who is a cancer survivor -- and having heard Andy's harrowing story from Carrie herself, I see where those personal moments are inserted into the narrative. Despite the fact that Harris's writing never takes itself too seriously, there is definitely an underlying gravitas happening beneath the surface. The fact that the paranormal beings Harris's protagonist must fight are demons rather than zombies, werewolves, vampires or any other paranormal being, is clearly symbolically intentional: because cancer is a demon that survivors must fight in myriad ways. Don't miss the acknowledgements as well as the Q & A with Carrie at the end of the book to learn more about the inspiration for this story. It will make you read it in a whole different light.